This wedding season, hairstyles are going all no-fuss. Minimalism rules the roost and this is so much better for hair health too – because the product overload and heat exposure is that much less. And if you are blessed with naturally long tresses, there is so much you can do to look the typically traditional and demure bride. Traditional hairstyles are very much in, irrespective of the budget of the wedding or the expected guests and VIPs. Taking cue from traditional south Indian brides, here are a few traditional hairstyles for long hair. 1. Simple bun – The traditional bun orkondaiis a great option not just for family and friends, but for the bride herself too! What’s more, it is super easy to execute and is done in a jiffy. 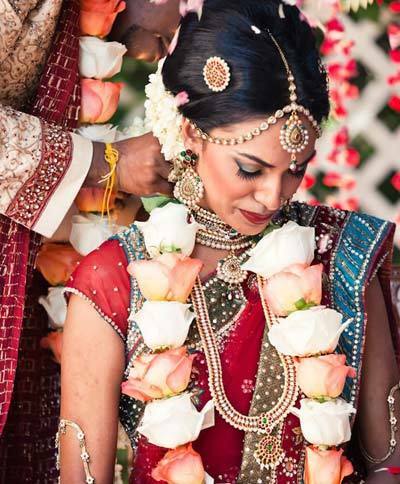 A traditional South Indian bride is rarely married without jasmine flowers (or malli poo) in her hair. And the simple bun looks ethereal wrapped in jasmine flowers. 2. Doughnut bun – A variation to the traditional bun could be done using a doughnut accessory for the hair. Get one or two (or more) rounds of the jasmine around your bun, securing it to your bun after every few inches with a bobby pin. Pin as you go around the bun for best hold. 3. Backcombed bun – To add height to your frame, backcomb the crown area and then make a bun. Top off with fresh flowers for a vintage sixties look. 4. Braid with jewelery – The most basic South Indian wedding hairstyle is a braid – with lots of embellishments. The two classic hair accessories for such a hairstyle is thenetti chutti(the south Indian counterpart of the Maatha patti) and the lovely kunjalam – a tassle worn at the end of the braid to complete the hairstyle. 5. Long bridal braid with flower mandala – Plait your luscious locks into a plait and wrap flowers where the plait starts. 6. Left open with accessories – Straight hair is best suited for this style. If you have thick and voluminous hair, even better. You may want to iron it out just to make it look neat. Simply part in the middle and take a small section from above each ear and pin in the centre on the back of the head. This hairdo is idea for smaller functions such as a sangeet or mehndi. 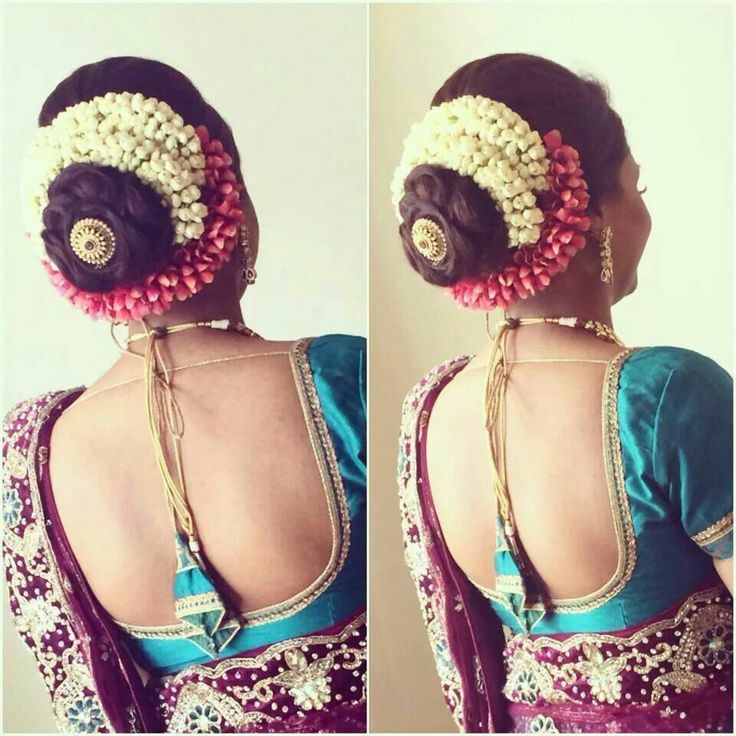 For more ideas and inspiration on South India wedding hairstyles for long hair, do have a look at the mood board we have created for you.